Queens Of The Stone Age are on the final leg of their Villains headline tour, which included the one-off charity show they put on at the Museum of Old and New Art. Frontier Touring have announced that Queens Of The Stone Age raised a huge $20,000 from their charity show to donate to the Royal Hobart Hospital’s Paediatric Ward. 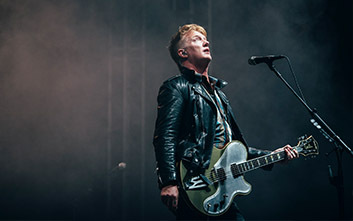 Prior to the show, iconic frontman Josh Homme announced why he chose the unique Tasmanian venue for the live, all ages concert. The one of a kind show was by far the most intimate venue of the entire Australian tour. What makes it even more memorable is that the entire MONA performance was recorded to commemorate the extra special occasion. Post-concert, the band dropped into the Royal Hobart Hospital Paediatrics Ward to visit some of the patients. This year’s Australian tour has definitely been one to remember. From members of the band performing exclusive DJ sets, to having Aussie as anything pub-punk shed-rock band, The Chats, open their sets. 2018 has been a pretty great year for Queens Of The Stone Age.